This concentrated paste provides the unsurpassed ability to clean, polish, de-oxidize and protect most metal, plastic or fiberglass surfaces. The maximum strength, easy-to-use formulation works quickly to restore the most stubborn surfaces while providing lasting protection for up to 6-months. The acid-free formula won't dry out and leaves no residue. Non-abrasive, non-toxic and non-flammable. 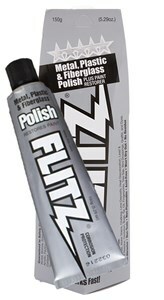 The Flitz polishing paste is great in a variety of uses such as: removing tarnish, rust, water stains, lime deposits, oxidation, bugs, tar, graffiti, scuff marks and fingerprints to name a few. Works well with Flitz Buff Balls, Flitz Microfiber Polishing Cloths. For use on: Brass, Copper, Silverplate, Sterling Silver, Chrome, Stainless Steel, Nickel, Bronze, Solid Gold, Aluminum, Annodized Aluminum, Beryllium, Magnesium, Platinum, Pewter, Factory Hot Gun Bluing, Painted Surfaces, Formica, Cultured Marble, Corian, Glass, Plexiglas, Plastics, Fiberglass, Eisenglass, And Armatel. Not for use on electroplated finishes, "fantasy" gold or other sprayed on finishes. Choose from two convenient sizes: 1.76 ounce (50 gram) tube or the 5.29 ounce (150 gram) tube. Made in the USA. Shipping weights: 1.76 oz. tube weighs .15 lbs and the 5.29 oz. tube weighs .45 lbs.